(Original image by Hljod.Huskona / CC BY-SA 2.0). I used to hate neural nets. Mostly, I realise now, because I struggled to implement them correctly. Texts explaining the working of neural nets focus heavily on the mathematical mechanics, and this is good for theoretical understanding and correct usage. However, this approach is terrible for the poor implementer, neglecting many of the details that concern him or her. This tutorial is an implementation guide. It is not an explanation of how or why neural nets work, or when they should or should not be used. This tutorial will tell you step by step how to implement a very basic neural network. It comes with a simple example problem, and I include several results that you can compare with those that you find. I tried to make the design as straightforward as possible. The training algorithm is simple backpropagation. There are no hidden layers (I will treat that in an upcoming tutorial), no momentum, no adaptive learning rates, and no sophisticated stopping conditions. Those are, in a sense, easy to add once you have a working neural net against which you can benchmark more elaborate designs. To keep the implementation simple, I did not bother with optimisation. This too can easily be addressed once a working neural net is in place against which you can verify correctness and measure performance improvements. The brief introduction below is a very superficial explanation of a neural net; it is included mostly to establish terminology and help you map it to the concepts that are explained in more detail in other texts. The problem we are trying to solve is this: we have some measurements (features of an object), and we have a good idea that these features might tell us in which class the object belongs. For example, if we are dealing with fruit, knowing the size, colour, and “roughness” of the skin, we might deduce which type the fruit is. Of course, we want a program for this. Now in heaven, there is a function for exactly that task – we give the function the features, and it spits out the class. Down here on earth, we are not so lucky (well, not for most problems anyway). So instead, we have to do with some approximation. 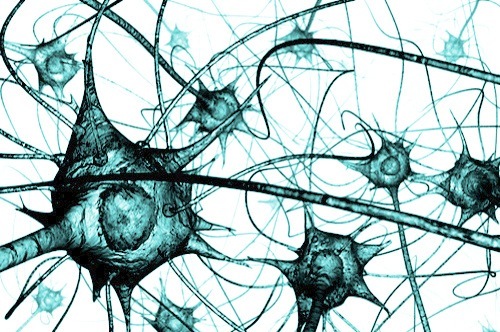 A neural net is one possibility – there are also others. A neural net (one without any hidden layers) is parameterised by a weight matrix. Different problems in general have different weight matrices. To solve our problem, we need to find a suitable matrix. If both our set of known samples and the problem itself are reasonable, we might expect to find such a matrix. But not directly – we have to use some kind of iterative scheme – we have to “train” our neural net. We use some of the known samples for this. Behind the scenes, the weight matrix and the feature vector are combined using some matrix operations to give the output vector, which is converted to a class. The mathematical details of this can be found elsewhere (more). After we have trained the neural net, we can use it in an application to classify objects that we may or may not have encountered before. Generally, the training and application programs are separate. The training program is the difficult part; most of the tutorial deals with training. It is common to divide the known samples in three sets, called the training set, validation set, and test set, typically divided in the ratio 50%, 25%, and 25%. 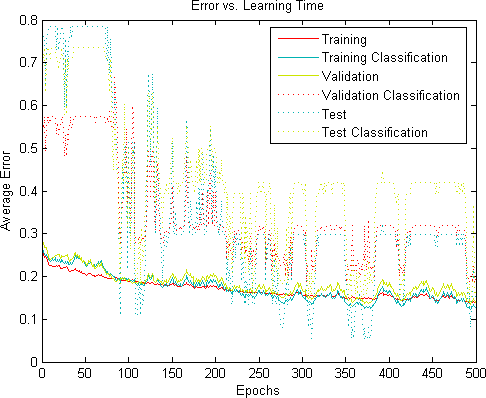 The training set is used to update the weights iteratively; the validation set is used to stop the training algorithm, and the test set is used to estimate how well our trained neural net will do in the wild. Each iteration of the training algorithm is called, quite poetically, an epoch. Many different things affect the number of epochs we will need to train the neural net: the problem complexity, how we scale our updates, and how the weight matrix has been initialised. We can control the speed with a parameter called the learning rate. In general, higher learning rate means faster learning (although, when it is set too high, the network might become unstable and not learn at all). In cases of non-numeric values, we convert whatever we have to numbers with some scheme. For instance, when dealing with colours, we might want to use RGB values, or we might want to make a list of colours (red, yellow, green, etc. ), assign a number to each of these labels, and use the corresponding number. Classes, usually not being numbers, are similarly treated: we assign a number (often arbitrarily) to each class, and use that in our computations. For the actual training, however, we use an output vector. The output vector has a 1 in the position of the class number, and 0 everywhere else. It is convenient to put all the inputs of a set together in a single matrix, where each row is a sample. Similarly, outputs and classes are also put into matrices, with input sample in a row (say row number n) corresponds to output sample in row n, and also the class in row n.
The implementation below makes use of high-level matrix operations. This avoids many of the errors that can creep in loop-dense code. The following table will give dimensions of all the matrixes involved; this will be helpful during implementation (especially for assert statements). The numbers are given in terms of the number of inputs (features) of the problem, the number of outputs. First we load in the data: the training samples, the validation samples, and the test samples. Then we start to train: we run the backpropagation algorithm on random samples. After each iteration, we see how our network is doing so far (on the validation set), and then we decide whether to keep training or not. After we stopped, we do a final evaluation of our network on the test set – this gives us an indication of whether the neural net will generalise well to samples not originally in the training set. After we have found a weight matrix that we can live with, we cfan incorporate this in the application were we need the functionality. A library that plots graphs (x versus y). If you can’t find a matrix library for your implementation language, then you can write a simple library yourself. Since neural nets do not require matrix inverses or long chains of matrix products, you need not worry (much) about numerical stability, thus the implementation is straightforward. It is possible to define the product for arbitrary matrices, but we don’t need it. If no graph libraries are available, simply write a function that will output a tab-separated list of the input and output sequences to plot. You can then load or paste this into your favourite spreadsheet program to make the necessary plots. This is very simple: implement a function that converts an output matrix to a class number vector, and another that converts a class number to an output vector. (The second function will convert the second matrix back to the first matrix). These three files contain samples from the ICU iris dataset, a simple and quite famous dataset. In each file, samples or contained in rows. Each row has seven entries, separated by tabs. The first four entries are features of irises (sepal length, sepal width, petal length, and petal width); the last three is the outputs denoting the species of iris (setosa, versicolor, and virginica). I have preprocessed the values a bit to get them in the appropriate ranges. You must read in the data so that you can treat the inputs of each set as a single matrix; similarly for the outputs. This makes it more useful to send the data as parameters. The function must take as arguments an input matrix, weight matrix, and a bias node matrix. The bias matrix is a constant column vector of 1s with as many rows as the input matrix. This vector corresponds to the bias nodes. The implementation here is a bit clumsy, but for now, the approach used here minimises the potential for error. This function must take in a maximum weight, a width and height, and return a matrix of the given width and height, randomly initialised in the range [-max_weight max_weight]. 7. Implement a function that evaluates the network error. The function must return the error e, and the classification error c.
To compute these, first compute the output matrix Z using the feed-forward function (you can ignore the net matrix). The function must return an updated weight matrix. For now, return W as is. The training function should take in three sets, the training_set, validation_set, and test_set. Implement a way to limit the maximum number of samples that will actually be used for training (you can also do his in the main program described in the next section). This is very helpful for debugging purposes (especially if you plan to later replace the backpropagation algorithm with something a little faster – and more complicated). The function should return a weight matrix, and error values as floats. Initialise a value plot_graphs to true. This is a debug flag, so it is appropriate to implement this as a macro if it is supported by the implementation language. The function should initialise a weight matrix using initialise weights. For now, use a max_weight of 1/2. The function should also construct three bias vectors bias_training, bias_validate, and bias_test. Each must contain only 1s, with as many rows as there are inputs in the training, validation and test sets respectively. Implement a while loop that stops after 500 iterations. (We will change the while condition later to something else, so do not use a for loop). Inside the loop, call the backpropagation algorithm. Use the training set inputs, the weights, (for now) a fixed learning rate of 0.1, and bias vector bias_train. Assign the result to weights. Still inside the loop, call the network error function three times: one time for each of the training, validation, and test sets. Use the weight matrix, and the appropriate bias vector. Wrap these calls in an if-statement that tests for a value plot_graphs. (If your language supports it, you can use conditional compilation on the value of plot_graphs). Store the errors in six arrays (error_train, classification_error_train, etc. ), with the current epoch number as index. After the loop, plot the six error arrays as a function of epoch number. Wrap this in an if-statement (or conditional compilation statement) that tests for the value plot_graphs. Call the network error function again, on all three sets as before. Return the weights, and the six errors. The program should load in the sets (using the load_sets function), and pass these to the training algorithm. The important thing is that everything should run. You should see your error plots; at this stage they should be straight, horizontal lines. Because of the random weight initialisation, we cannot predict where these lines will lie (so do not be alarmed if they do not look exactly the same as below – as long as they are straight and horizontal). You have already created the dummy function; now you can put in the actual calculations. First, select a random sample. Now, calculate the net matrix and output matrix using the feed-forward function. 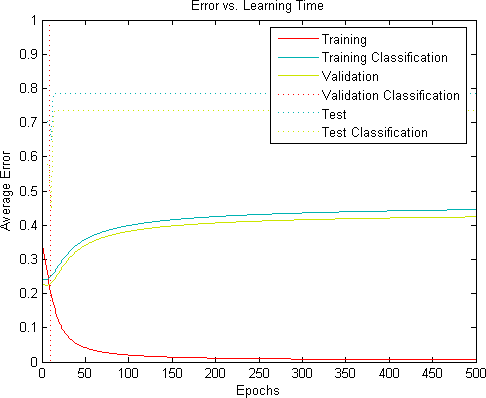 Notice that the error curves are smooth, the training error rate goes to 0, and the other error rates go to 0.4, plus or minus – this depends on the initial weights. It will also be different if you use a sample other than the first. The important feature of the error curves is that they should steadily descent on average. If your curve does not resemble the one shown here; there is a mistake in your implementation. It is often helpful to limit the training set to a single sample (thereby eliminating the randomisation of sampling during training) to see what is going on. Although the errors often follow the relationship training < validation < test, this is not always the case, so do not be alarmed if this is not true on a run (You can see it is not always true in the run above). Change the while loop to stop when the validation error drops below a threshold. Note that this threshold usually depends on the problem. There are better stopping conditions that are less sensitive to the problem at hand, but this one will do for now. This part is important for you to get an idea of the robustness of the neural net. In practice, a very simple analysis will suffice. classification error (on the test sets). In general, you would like all these values to be “low”. Here are some experiments for the iris data set with different learning rates. For each, 30 runs were made; other parameters are as described earlier (max_weight = 1/2, validation_stop_threshold = 0.1). To use the neural net in a program after you have trained it, you need to save the weights found by the training program to a file. Your application must then read in this weights, and use it with the feedforward function to calculate the class. Here is pseudo-code for the program. Note that the training program and classification program needn’t be implemented in the same language. This allows you to take advantage of speed and interface components that might not be available in your target platform. It is a very good idea to implement your training algorithm on a computer algebra system (such as Matlab or Octave) where you can take advantage of both matrix and graphing capabilities (the code provided below works in both). When using your neural net for other algorithms, you might need to change the learning rate, stopping threshold, and weight_max for weight the initialisation. The error plots are indispensible for this purpose. As long as the learning rate is not too high, it should not affect the quality of the solution, only the number of iterations necessary to obtain it. The stopping threshold, however, has does affect the quality of the solution: if it is tool low, the problem might not be solved, or the neural net might train very long; if it is too high, you will get poor performance. There are better stopping conditions available; once you have everything working, you should investigate these. Remember that you should not base your decisions on a single run, as runs can differ quite drastically from one another. Perform a few runs, and base decisions on these. The value weight_max can usually be chosen as 1/sqrt(input_count) with good results, but here too it depends on the problem. The following code works in Matlab and Octave. (Included is a randint function; if you are using Matlab you can remove it, because it is already implemented in Matlab). The program provided cheats a little – instead of reading in the raw .dat files, it reads in the .mat file that already has the data in the right structure. How to Turn XSI Mod Tool into a Level Editor for your XNA Games: Updated for XNA 3.0.